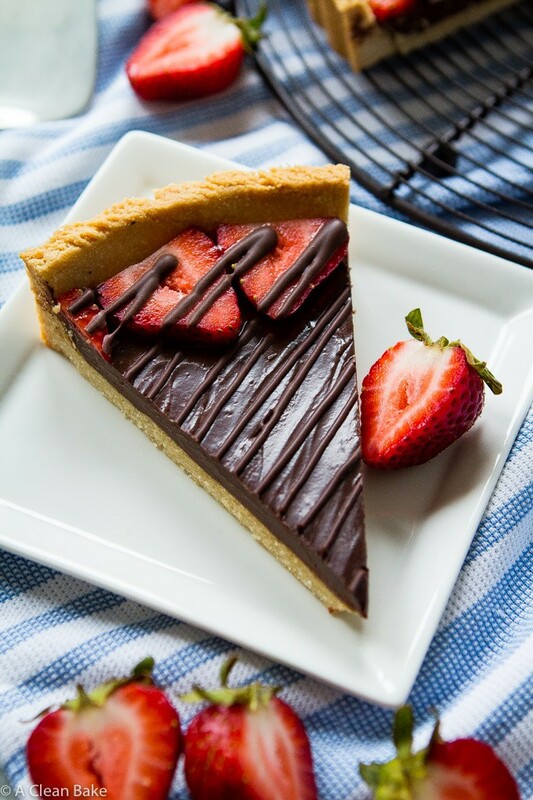 This paleo chocolate ganache tart will satisfy your craving for something rich, decadent and deeply chocolatey. And you won’t believe how low maintenance it is to make. The crust is prepared in the food processor and can be made ahead of time. The filling comes together with a bowl and spoon and requires no baking! Add the easy garnish and it’s ready to be devoured. Let me tell you a little story about a failed Whole30 and a paleo chocolate ganache tart. Despite all the years I have been cleaning up my diet, and all the (relatively) healthy treats we have around at a given time, I’m married to a man who, for most of the time I’ve known him, wants a burger and fries, followed by a slice of box-mix cake and a side of ice cream as his death row meal. Or, really, any meal. Shockingly (not shockingly, actually), he’s felt like crap for years and has also been borderline ready to murder me because of the number of times I smugly reminded-slash-nagged him that he really should eat healthier. Like anyone, and any major life change, he had to come to the decision himself, and a couple of weeks ago, as we were returning from our vacation, he decided he wanted to start a Whole30. The next day. If you’ve done a Whole30, you know that it takes a substantial amount of planning: learning what you can and can’t eat, meal planning and prep, reading labels and adjusting your normal eating and, especially, snacking routine. He thought he was prepared but ended up just cutting out a lot of food without replacing the calories and was, understandably, miserable. After a few days of hating his calorie-deprived life, he relented and we figured out a way to make sustainable changes that would provide enough healthy calories to, you know, function, without resorting to processed and otherwise unhealthy food. Too much meat is just as gross as too many carbs. Life is too short to not eat a little dessert if you can. I spent way too long being forced by my ailing body to eat an even more restricted diet than the Whole30 allows, and although it was exactly what I needed at the time (and was the only way I was able to start to heal), I’m so glad that’s behind me. There should be joy in eating, and that means eating dessert sometimes, too. If you’re on this site, I’m assuming you agree? 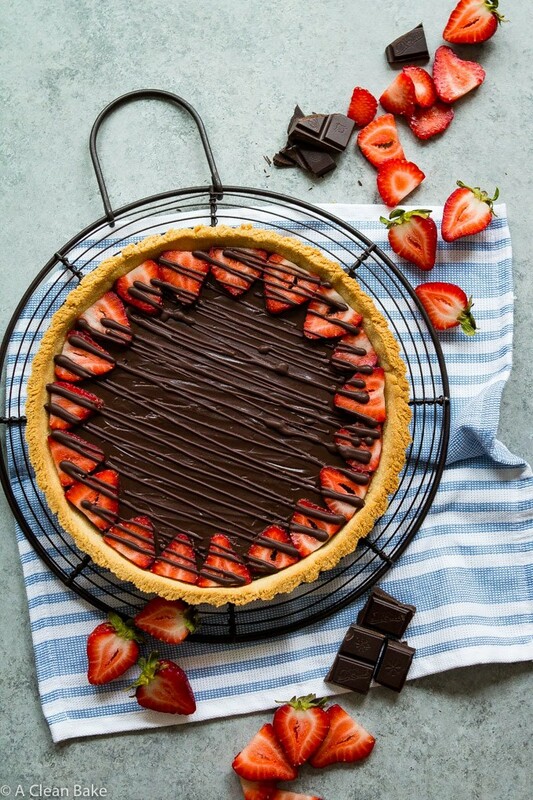 Look, I’m not saying you have to eat a slice of flaky-crusted, ganache-layered, juicy-fresh-berry-topped tart with every meal, or every day, but a little bit of goodness waiting for you in the kitchen makes getting out of bed in the morning that much more appealing (particularly after night one million of 5 hours of sleep). What I’m saying is this: Eat healthy. Nourish your body. Watch the sugar and stay away from garbage. 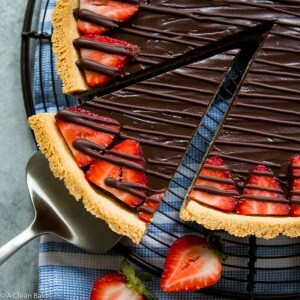 But also, this tart shell can be made ahead and stored in your freezer for several weeks, and you can pull it out and pour in a layer of microwave-and-stir ganache, top it with some fresh, juicy berries, and feel like a superwoman or -man in front of guests, or just for your family, all the same. So, in the end, I don’t really have a great story about this tart; no elegant dinner party or casual weekend gathering where we discussed Nietzsche or the Kardashians (whichever keeps the conversation flowing) over glasses of rosé and slices of this tart. Do I need one? 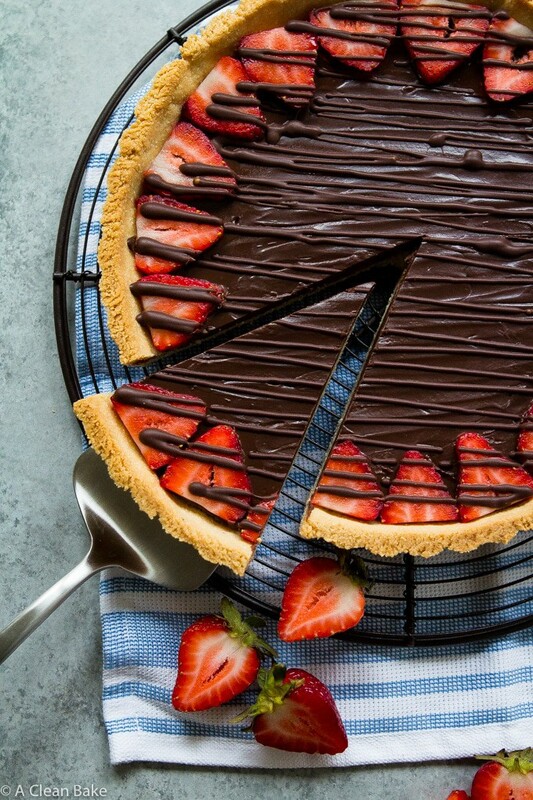 Does one ever need a justification for a chocolate ganache tart, other than the fact that it is a chocolate ganache tart and wo/man cannot live on grilled chicken breast alone? PS: Please don’t be put off by the length of this recipe. The actual process is very easy, and although there are a few components, they are not excessively time consuming. If need be, you can make the tart shell in advance and store it in an airtight container until you’re ready to use it. If you’re making it more than a day or two ahead, freeze it until you’re ready to use it, and bring it back to room temperature before filling it with ganache. 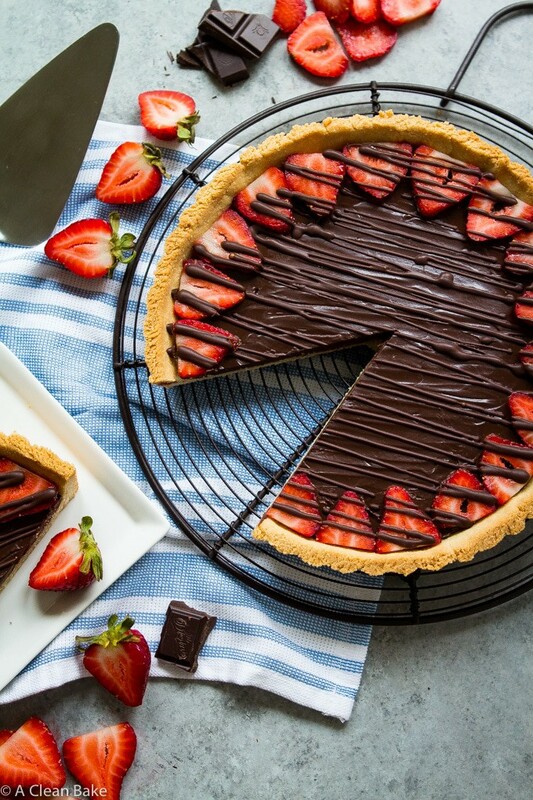 This paleo chocolate ganache tart will satisfy your craving for something rich, decadent and deeply chocolatey. And you won't believe how low maintenance it is to make. The crust is prepared in the food processor and can be made ahead of time. The filling comes together with a bowl and spoon and requires no baking! Add the easy garnish and it's ready to be devoured. Preheat the oven to 350°F. Lightly grease a 9.5" removable-bottom tart pan and set aside. In the bowl of a food processor fitted with the "s" blade, pulse the flours and salt together a few times to mix. Add the egg white and maple syrup and process until a ball forms. Add the butter or oil in chunks, then pulse until evenly distributed and no pieces bigger than a pea remain. Lightly dust a large piece of wax or parchment paper with tapioca flour and lay out on the counter. Turn the dough ball out onto the prepared wax/parchment paper. Dust the top of the ball with a little more tapioca flour and cover with another large piece of wax/parchment paper. Roll the dough out to approximately 11.5" (so, one inch larger on either side than the bottom of the pan). Carefully transfer it to the prepared pan and press it into the edges in an even layer. Bake for 25 minutes until firm. Remove shell from the oven and allow to cool before adding the ganache. Place the chocolate in a heatproof bowl and set aside. Pour the coconut cream into another heatproof bowl. Microwave on high in 30-second increments until melted (fully liquified with a very thin consistency). This will probably take 60-90 seconds. Pour the cream over the chocolate and stir until the chocolate melts completely. It may take longer than you'd expect, but the residual heat of the coconut milk will melt the chocolate. Keep stirring until the mixture is completely smooth. Stir in the espresso powder and salt (if using). Pour into the cooled shell. Allow the ganache to come to room temperature in the shell before transferring to the refrigerator for about an hour (or more, if necessary) to cool completely and firm up. 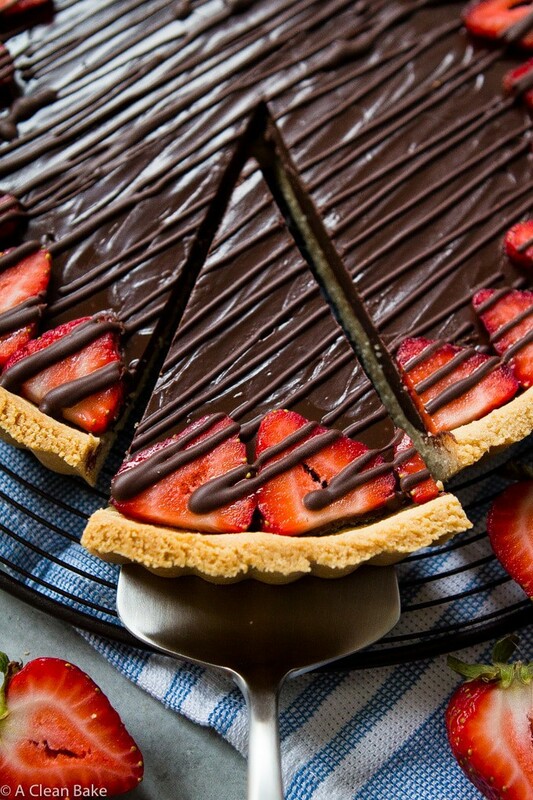 Arrange the strawberry slices around the border of the tart. Melt the chocolate and oil in the microwave in 20-30 second increments, stirring in between, until smooth. 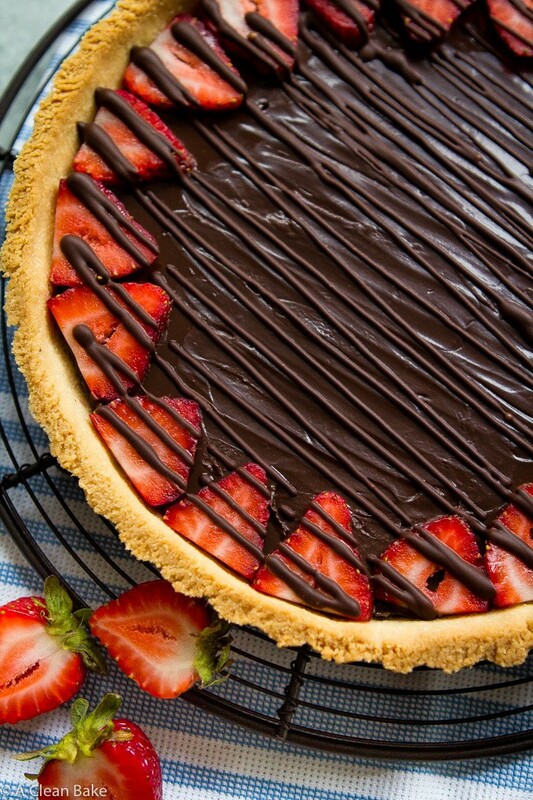 Use a spoon to drizzle it over the top of the tart. Let the drizzle set for a few minutes before serving. Please don't be put off by the length of this recipe. The actual process is very easy, and although there are a few components, they are not excessively time consuming. If need be, you can make the tart shell in advance and store it in an airtight container until you're ready to use it. If you're making it more than a day or two ahead, freeze it until you're ready to use it, and bring it back to room temperature before filling it with ganache. 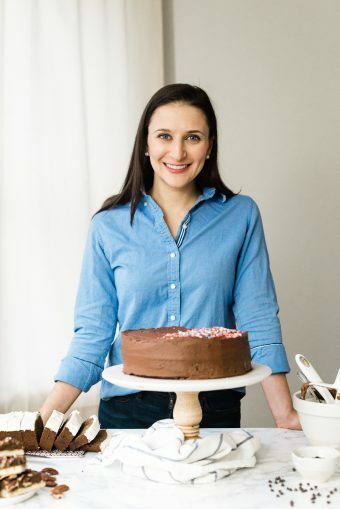 You can even also add the ganache ahead of time, and store it in the fridge for up to 24 hours. Wait until the last minute (just before serving) to add the strawberries and drizzle. My mother warned me about girls like you! Talk about an easy seduction to the dark side! The ingredients I’m missing have already been added to the list for our next weekly shopping trip. Thank you. The recipe sounds so decadently delicious! I haven’t tried it – sorry! I typically do not recommend replacing granulated sweeteners with liquid ones though. Looks incredible! And I’m with you on team balance-for-sustainability. Sometimes you just need dessert! Hi there, I am perplexed as to where the egg white plays into the making of the crust. I see it in the ingredient list but no where in the instructions. Hi Dafna! The egg white gets added with the maple syrup. Sorry about that mistake. It is corrected now! Can I use real cream instead of coconut cream? I’ve never tried it, so I can’t say for sure, but you can try! The worst case scenario is that the filling will be a little soft and not set completely. Can’t wait to try this beautiful cake for my son’s birthday!!! !